It happens because Volts engine tries to create some files based on your template ones, but it can't due to permission restritictions. Change your views directory permissions to 777 and apply to enclosed files and folders and try again. I don't know if adding 777 permissions to this folder/files is a good practice (probably not), but for development environment it will solve your issue. hi, Does this directory /var/www/html/phalcon/public/../Volt/ exists and is it writable? chmod -R a+w app/cache works for me and I don't think giving 777 permission to views folder is a good idea. Change volt file permission (Inside app/cache) to 777 .Its working fine. hello， can you help me. Now have the same question in phalcon v-7.2.14 . the cache config is'cacheDir' => BASE_PATH . '/cache/', I have given Permission to any. But error when using volt engine. Only your cache dir should be writeable in this case. The views dir should be readable. On what user is php running? Hello, the cache and views dir both are readble and writeable. 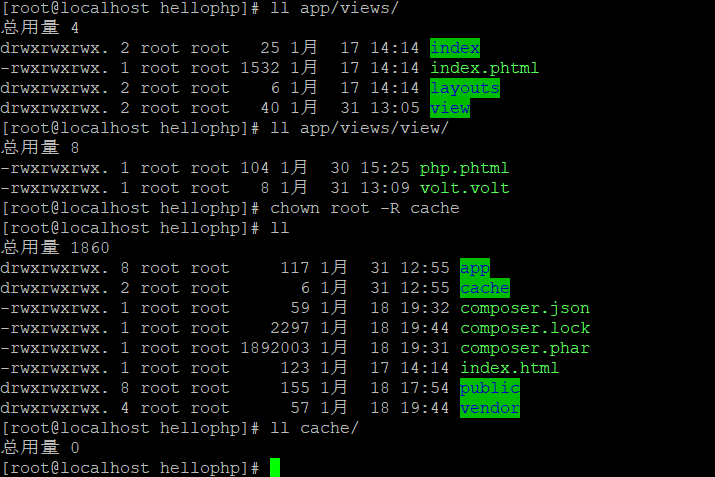 PHP Server Administrator is [email protected]. @Flcwl can you hook me up on discord? Let's see if we can pinpoint the issue there and post the solution here. I'm glad to do but how I can do with it?